Locate the Tohoku Express Way running north from Tokyo, about 65 kilometer inland, near the Shinkhansen railroad line. Exit left (north) in Nasushiobara onto Hwy. 17. 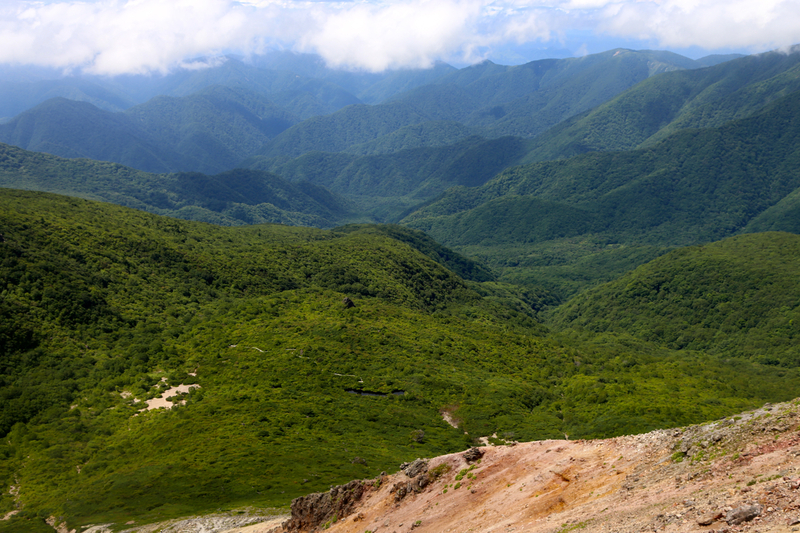 Follow signs for Mount Nasu and drive uphill to the end of the road where you find a large (free) parking area. Park here, this is the trailhead, location N37.12843, E139.97557, elevation about 1465 meter. The trail starts to the right hand side of the parking area when facing uphill. Follow the nicely made trail as it gently climbs into the valley having Nasu (1915) up on your left and the interesting looking Asahi (1896) up on the right hand side. 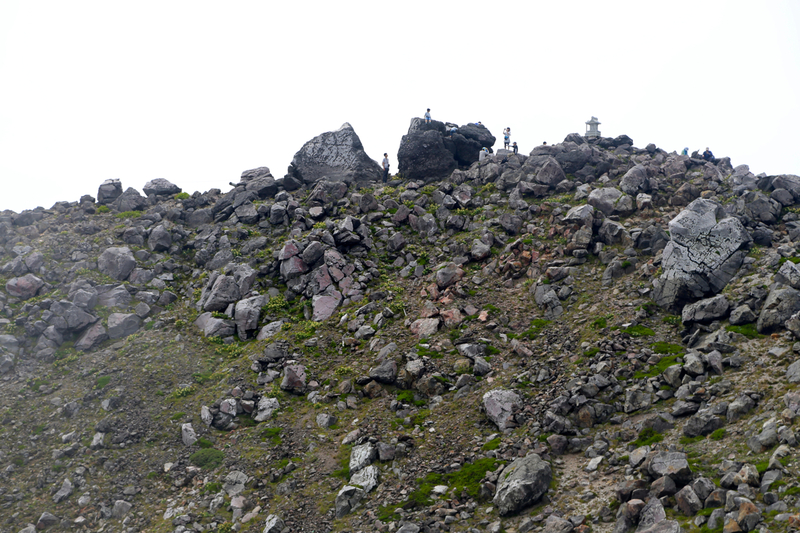 You will soon reach a broad col with a small hut, location N37.13065, E139.96219, elevation 1725 meter. Turn left and follow a good trail to the summit. After completing our trip to the Japanese ultra prominent mountains, we had several "reserve days" before our flight back to Norway. We decided to stay three days in the city of Mito, north of Tokyo and do some sightseeing as well as a possible extra climb. 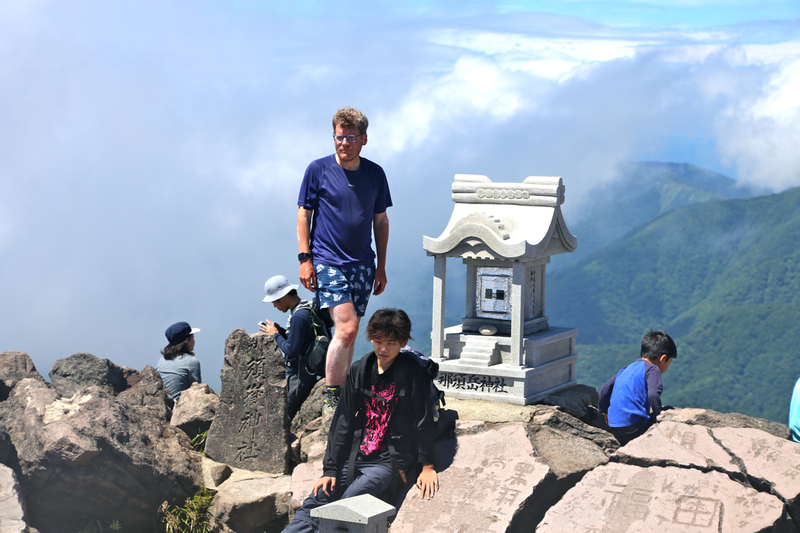 While Pål Jørgen stayed behind in Mito, Geir Åge and I drove up north-west to climb this prominent peak as well as visiting the nearby Mount Nasu (also called Chausu), that is featured on the list called "100 famous Japanese mountains". We left Mito shortly after 0600 and were parked at the trailhead before 0800. The information sign told that the hike to Sanbonyari would take a bit more than 3 hours. We left at 0800, made the first col in 30 minutes and enjoyed the good weather and the nice trail across to Sanbonyari, arriving there at 0930. A few people were already there, we had also seen some hikers along the trail, but overall, this trail had fewer people than the last couple of peaks we had visited. 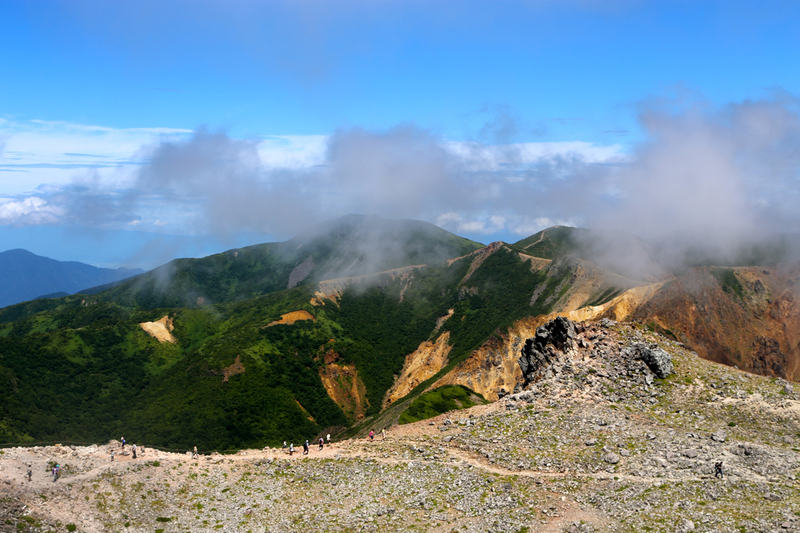 We rested until 0940, walked back the same way, but included a short side-trip to the 1896 meter summit of Mount Asahi. 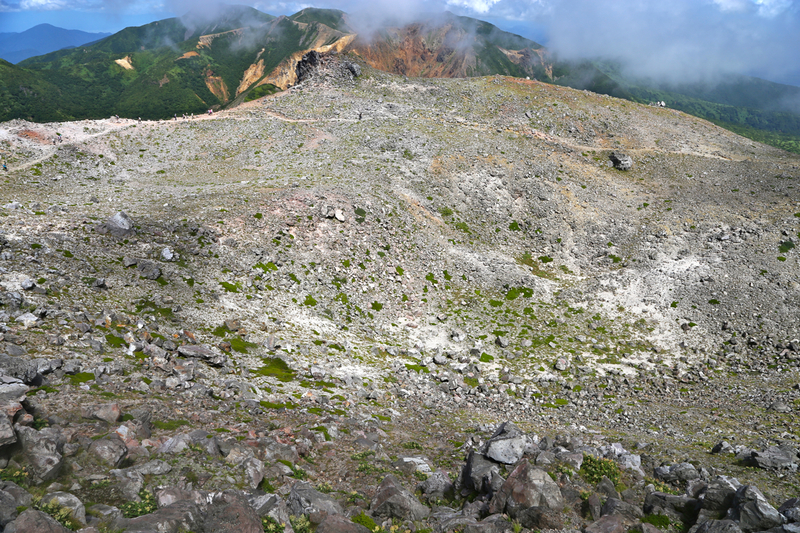 From the col with the small hut, we then started a short and pleasant ascent of Mount Nasu. We were on this summit at 1110, another 1:30 since leaving Sanbonyari. This summit was quite a bit more crowded, people may take a rope-way gondola more than half-way up the mountain, then ascend the final stretch. 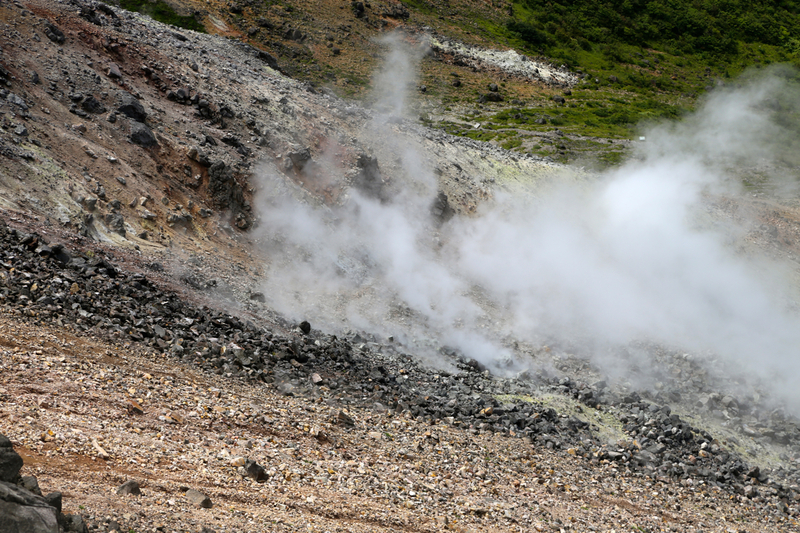 This mountain smells sulphur, in fact the gas is leaking out far down on the oppsite slope. 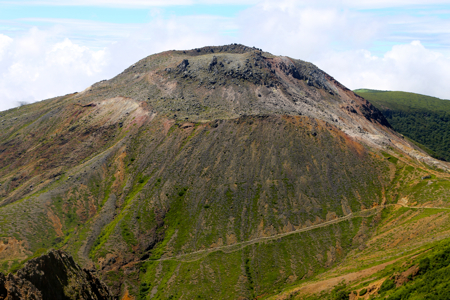 The last eruption was as recent as in 1963. Leaving at 1130, we walked around the small crater, then descended back down to the col and onwards down the valley to the trailhead, arriving there at 1215. Here is a quick summary of peaks climbed in my trip to Japan. Valley view, from near the summit.